“The home fitness test, a fitness assessment program that can be done at home with minimal equipment. You don't need to pay a gym instructor to test you, and you can retest yourself as many times as you like." Whether you are doing exercise to get fitter, gain muscle, lose weight, or just get healthier, it is important to test whether you are reaching your goals. Measuring your fitness level regularly is one way to find out if you're making progress, as well as being a great motivational tool. It is not easy deciphering the hundreds of fitness tests available. Some require expensive and cumbersome equipment, best left for the professionals in gyms or universities. Other tests require more than one person to conduct the test, or specialist skills. If you don't have access to a well equipped testing center, or cannot afford the hefty prices some charge, you don't need to worry. You have all you need to measure your own fitness level in your house! For the Home Fitness Test Manual we have chosen 10 fitness assessments that encompass the main components of fitness. The tests can be simply done by yourself, and are suitable for athletes of all levels - from those just starting out on a training program to high level athletes who want to monitor their own training results with ease. You don't need to be an exercise physiologist and personal trainer to test your fitness. Our free guide has all the details required, with annotated diagrams showing the required technique. See all the features here, or go straight ahead and download the complete manual. Sections of the manual are available on pages of this site, plus additional resources and information to help you do a fitness assessment at home. Equipment - list of equipment required to conduct the 10 tests in the Home Fitness Test. PARQ - list of questions to be completed by anyone who is looking to start an exercise program. Warm-Up - a recommended warm up procedure. Norms - for comparing your test results to others. Calculators - online calculators to help calculate test scores. Rating Scale - a unique rating scale to use with the home fitness test, where you can easily see which level you are at and where you need to get to. Recording Sheet - to record all test results. Downloads - all the downloads. Reference List - list of other fitness testing resources. Links: links to other website resources that supplement the details on this site. Contact form - to get all your questions answered promptly. 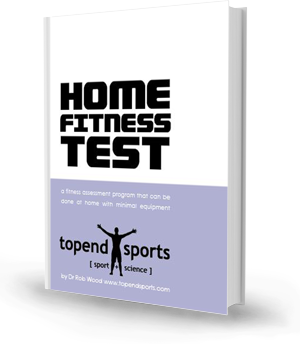 Home Fitness Test - FREE Download!